Many people think New Year’s resolutions are 100 percent worthless, but that’s not quite true. They’re only 92 percent worthless. How do I figure? Because 8 percent of the 126 million Americans who set New Year’s resolutions actually achieve them. By the end of the third week of January, somewhere around the 23rd (that’s today! ), 92% of folks out there will have almost completely forgotten they even made a pledge. But don’t despair. There’s a clear way to improve your chances of success. The number one biggest reason, New Year’s resolutions don’t stick, is because the goals are vague and unfocused. Just look at some of the top resolutions in America as noted by USA.gov: Lose Weight, Quit Smoking, Get Fit, Eat Healthy, Drink Less. They sound harmless enough, but these are huge, lofty, and also very undefined goals. 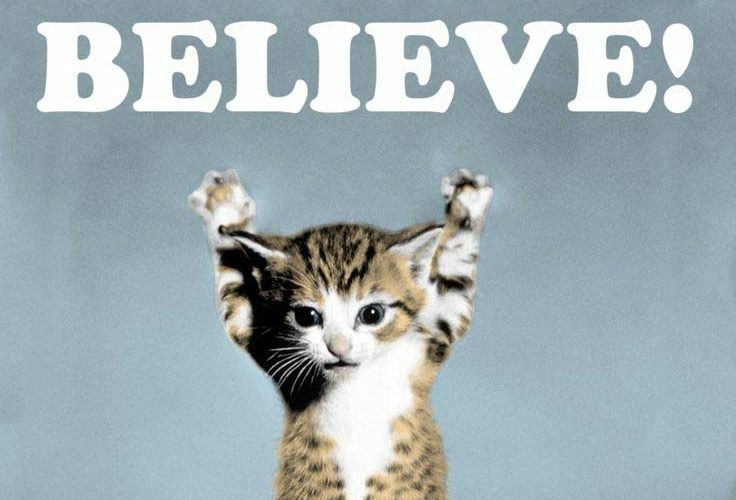 Getting a cat poster that says “Believe In Yourself” is not enough. Remember the comment about undefined goals above. You need to set a specific goal and make a detailed plan. Do you want to lose weight? Define exactly how much. Then define how you’re going to do it. Exercise for 30 minutes 4x a week. Cut calorie-intake 10 percent. Now write it down. Break your goal up into smaller goals. Do you want to run your first marathon this year? Great. Start by setting your goal at 10 miles by date A. Got that? Next, work toward 15 miles by date B. Then 20 by date C, and so on. This makes your ultimate goal less intimidating and also gives you measurable successes along the way. Set a realistic date to accomplish your goal. If your goal is to lose 20 pounds, you’re not going to do it overnight. Try 3.5 pounds a month for six months. Be as aggressive as your personality allows, but set yourself up for success. You can’t underestimate the power of friends and family who truly care about you. Tell them about your goal and simply ask for support while working toward your goal. You’ll be amazed how helpful they can be. OK, so maybe that cat poster is a good idea after all. It’s true after all. The more confidence you have in yourself, the more likely you are to succeed. Also, be sure to acknowledge your progress along the way to strengthen your resolve. What tips and tricks do you have for checking off your goals? I’d love to hear them. Previous Previous Is Running Good For Kids?